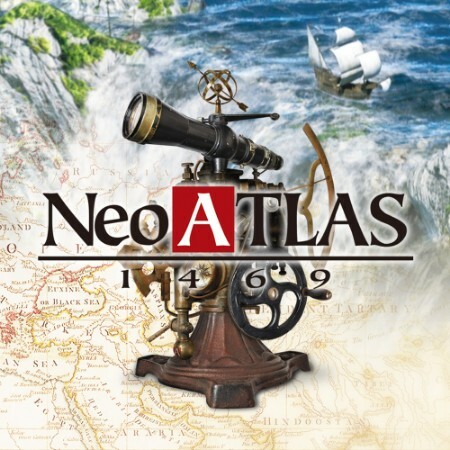 Neo Atlas 1469 is a game about mapping the world’s uncharted oceans and making some sweet trade money along the way. Is the Earth round or flat? Are there really waterfalls at the end of it? Do other landmasses exist outside of Europe and northern Africa? Only you can decide. Generally speaking, it takes two factors to influence my decision to purchase a new game: music and story. This time around, I found myself drawn to a game based on the art design alone. Neo Atlas 1469’s artwork is interesting to say the least. A quick search through NISA’s recent tweets yielded an image similar to the one seen below. Going off of that alone, I knew that this was going to be a weird and wild ride. What I didn’t expect was to walk away feeling both impressed and wanting more. The Neo Atlas series actually extends its roots all the way back to 1998 with the release of The Atlas on the NEC PC-9801. These games all share similar gameplay concepts, namely the ability to chart the entire world map (outside of Europe and northern Africa) and the ability to approve or disapprove of the results. Other shared ideas include trading various goods between cities and nations, developing new goods through these trades, discovering artifacts and oddities, and battling pirates and monsters. All of this is done with simultaneously expanding, upgrading, and managing your various fleets. 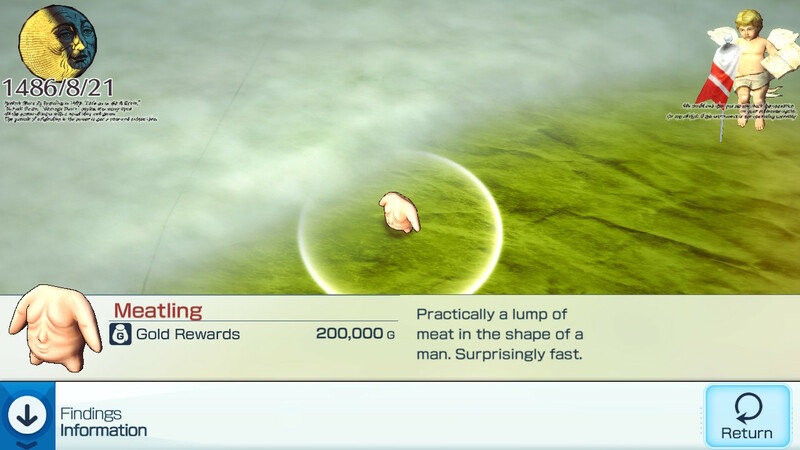 While I can’t speak for the execution of these features in previous series entrants, I am happy to report that they all marry quite well in this newest one. One of the largest draws for many players will be the cartography aspect of the gameplay. 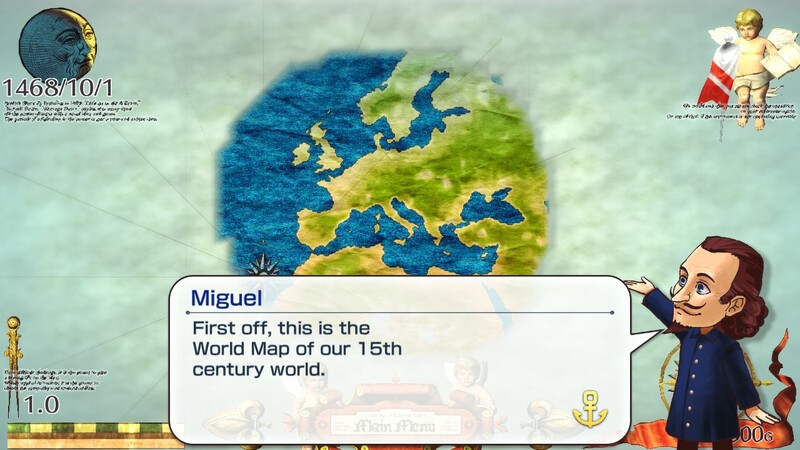 As previously alluded to, your main goal in Neo Atlas 1469 is to chart the entire world map. At the onset of the game, you begin as the manager of a trading company. You’ve been commissioned by the king of Portugal and your trading advisor Miguel to explore and expand the rather lacking map of the world. While Europe and the northern tip of Africa are already defined as they are on the real world map, the rest of the world is covered in a thick blanket of fog. You can remove this fog and add segments to the map by sending your company’s admirals on exploration voyages through it. When they return to their home ports, new pieces of the map will be revealed to you. This is where the real work begins. The entirety of the uncharted map is procedurally generated. This means that no two voyages and no two playthroughs will be the same. While your initially defined European region is historically accurate, the rest of your world doesn’t have to be. Additionally, if you find that you are unhappy with the results of a particular voyage, you have the ability to disapprove the generated map segment. If you send one of your admirals back into that same area again, they will return with different results. On some voyages, your results may look similar to the real world and on others you may end up with a series of islands where Australia is supposed to be. As both a completionist and someone who enjoys diagramming, this felt like a dream come true. I didn’t disapprove of as many voyages as I probably should’ve, so my map ended up looking largely the same as it does in real life. I will say though that southern Africa and South America looked rather strange for me. Perhaps during your playthrough South America won’t exist at all. Once your map begins to take shape, it’s time to explore those newly discovered areas. As your uncover more pieces of the map, you have the ability to zoom in and out with a great deal of precision. Zooming in all the way makes it hard to keep track of where you are on the map, but will sometimes reveal secrets treasures, new locations, and new bits of information. Overall, I appreciated this concept. Having said that, it did make locating new trading locations a bit of a pain. Keep in mind that depending on how close you zoom into segments of the map, some objects and locations may or may not be visible. Mapmaking certainly seems to be a staple of this series, but that means nothing if all you’re doing is repeatedly generating new map segments. This is where the baton gets passed to the trading portion of gameplay. With the exception of the main trade center in Genoa, Italy, each location that you discover will specialize in just one type of good. Lisbon, Portugal for example specializes in grapes. London on the other hand specializes in producing oak barrels. If you establish a trade route between these two locations, a new product will be produced as well (in this case, wine). Since this is merely a byproduct of the first trade route, you can establish a new trade route using the wine as a separate good. While both of those locations are set to always produce those products, over 90% of the other locations are not. If you’re lucky, you might find yourself with a myriad of different combination options all clustered together in one little area. The more that you experiment and trade, the more profitable that your company will be.